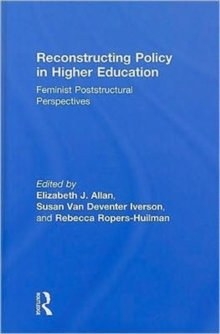 Reconstructing Policy in Higher Education highlights the work of accomplished and award-winning scholars and provides concrete examples of how feminist poststructuralism effectively informs research methods and can serve as a vital tool for policy makers, analysts, and practitioners. The research examines a range of topics of interest to scholars and professionals including: purposes of Higher Education, administrative leadership, athletics, diversity, student activism, social class, the history of women in postsecondary institutions, and quality and science in the globalized university. Students enrolled in Higher Education and Educational Policy programs will find this book offers them tools for thinking differently about policy analysis and educational practice. Higher Education faculty, managers, deans, presidents, and policy makers will find this book contributes significantly to their own policy analysis, practice, and discourse. Elizabeth J. Allan is an Associate Professor of Higher Education at the University of Maine where she is also an affiliated faculty member with the Women's Studies program. Susan V. Iverson is an Assistant Professor of Higher Education Administration & Student Personnel at Kent State University where she is also an affiliated faculty member with the Women's Studies Program. Rebecca Ropers-Huilman is a Professor of Higher Education at the University of Minnesota.